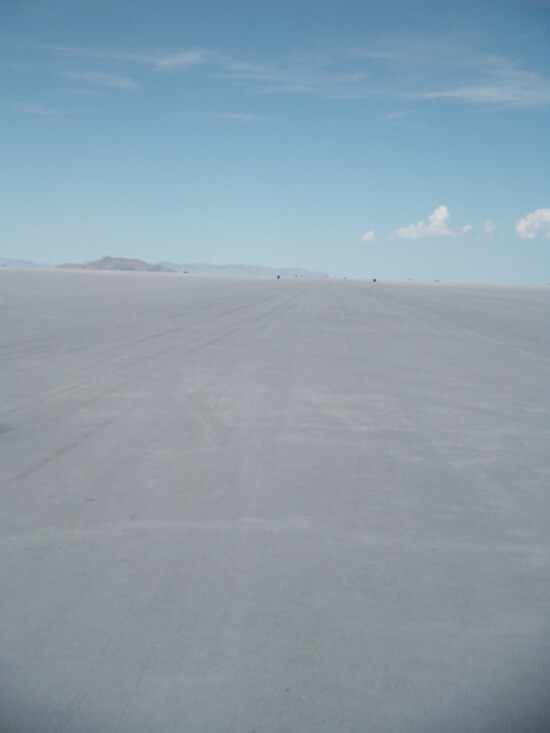 You can see pictures on the internet and read peoples tails about the salt flats at Bonneville, but until you drive your rental car off the pavement and onto the salt the true size and expanse can never fully be understood. I finally understood Sunday morning as I followed everyone down the road to where the pavement ended and the salt began. You instantly know why this is the place where you come to go fast, you will run out of speed before you run out of salt. I was invited to crew for Kevin Brooks, the Owner of Brooks Motor Works, who was racing 2 pre-1955 BMW’s. 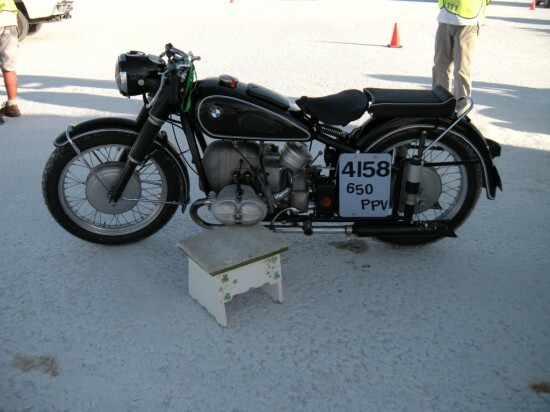 On Saturday he had raced down the salt in his 1955 BMW Sidecar at 94mph and was able to back that up on Sunday mornings return run and break his own record. The bad thing is that within the last 100 yards of his record run we found out later that the intake valve touched the piston and likely the exhaust valve, and with no back up cylinder heads, the sidecar would have to sit happy with a record. But this allowed us to concentrate on getting the 1954 R68 replica up over 103 mph to increase Kevin’s own Vintage Production record. 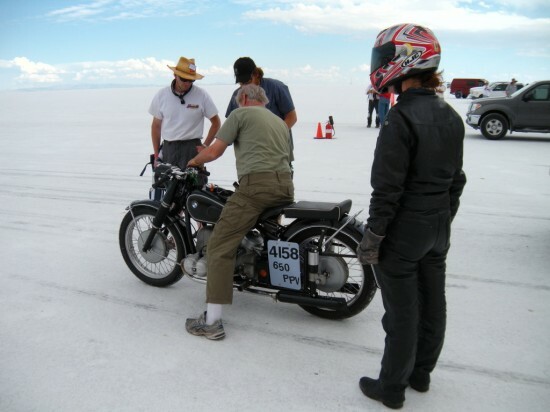 As many of you know getting a carbureted motorcycle to go fast is not the easiest thing to do. It is made even more difficult when the rules in which the bike is running, Vintage Production Push-rod, says that the motorcycle must look exactly like it left the factory. So velocity stacks, open megaphone exhaust, clip-on bars and rear-sets are out. Changes that can be made: cam, high compression piston, and internal modifications to a stock carburetor. The secret to making these run fast together is always in getting the right combination of air and fuel into the motor. Because the salt are at a high altitude you never have enough air and running lean can kill. The first couple of runs were hindered by the gear box that was filled with extra neutrals. Barbara, the fearless pilot and Kevin’s wife, was unable to get the transmission to cooperate. So after the first day of runs, it was time to switch to the back up gear box and go back at it. Back out to the line-up it was time to change main jets and make a run. Not there yet. Back to the line-up, change the mail jets again, and out for another run. Not there yet. Back in the line-up, change the jets and go for another run. You see a pattern here? 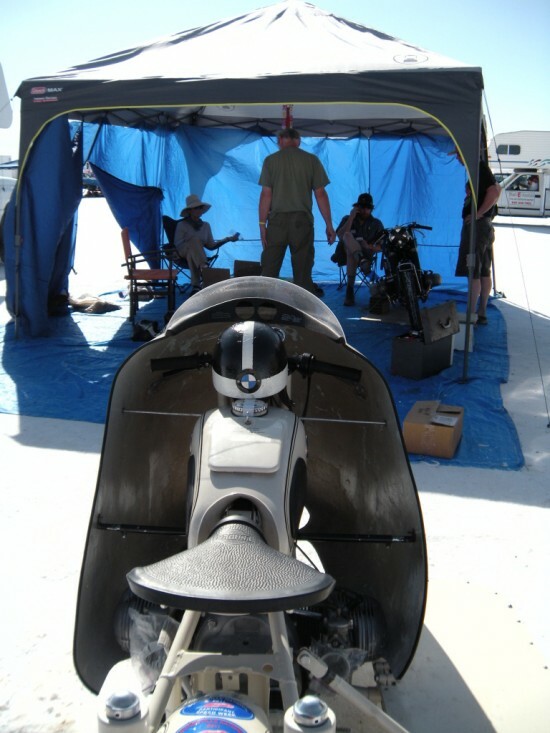 We all felt lucky because a BMW does not hide the carburetors under a gas tank, or behind plastic, so you only have to stand in the hot trailer for about 10 minutes. Because of this thing called work, I was only able to be out on the salt until Wednesday morning before my 12 hour drive home. When I left, the bike was getting faster, but not yet over 100mph. For the rest of the week Kevin will be out there, on the Salt trying. 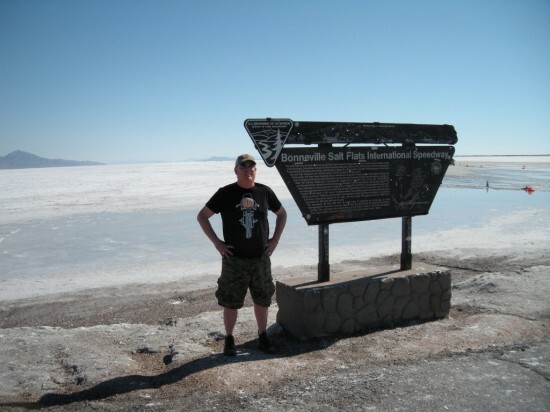 Bravo Brian – thanks for sharing your cool Bonneville experience! 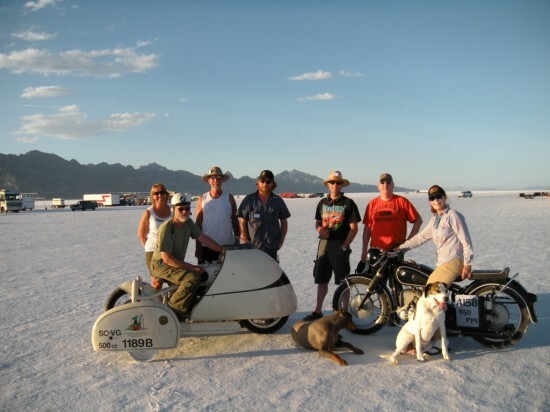 Loved the Bonneville stuff – let ESPN fawn all over Danica, Barbara’s a real racer!